During the European Renaissance (14th to the 17th century) kings, aristocrats, rich merchants and scholars collected curiosities like fossils, minerals, religious or historical artefacts, antiquities, stuffed animals or at least parts of them, and lot of other stuff and displayed them in "Cabinets of curiosities/wonders" (from the German term Wunderkammer). Fig.1. Dragon by U. Aldrovandi, from his opus magnus "Historia serpentum et draconum" (1640). 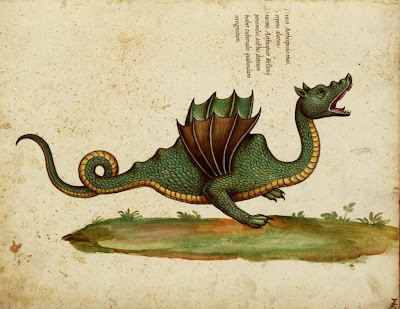 In the sea of internet a lot of dragons can be found: Dragons by Ulisse Aldrovandi (1522-1605) - I mentioned in an earlier post this Renaissance naturalist and his observations on fossils, however he was also an dedicated biologists, especially ornithologist and ichthyologist, the depictions of the animals are marvellous. It is often forgotten that becoming a fossil is quite hard, it's an own science called Taphonomy - and the actual Carnal Carnival dealing with this topic is found on Brian Switeks "Laelaps" post - presenting us to our ultimate fate: "Death and Decay". But it's also hard to find fossils; Michael D. Barton on his blog "The Dispersal of Darwin" linked to various articles on the first fossil hunters, like the Italian geologist Giambattista Brocchi (1771-1826), the brave and talented Mary Anning (1799 - 1847), who discovered the first recognized sea dragons, the baron of science Cuvier (1769-1832) and the explorer Humbodt (1769-1859), and Darwin as geologist. 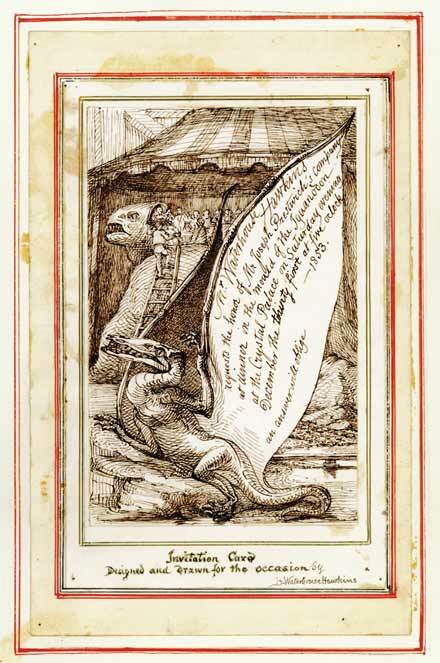 David Orr on "Love in the Time of Chasmosaurs" invite us to visit the dragons of the land as they were displayed in the Crystal Palace in 1854. To celebrate the inauguration of the dinosaur models, Owen organized in December 1853 even a dinner inside one of the models. Fig.3. 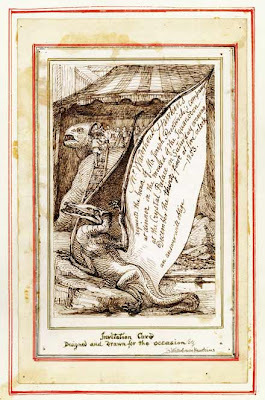 The invitation to the dinner held inside Hawkins’s iguanodon reconstruction in December 1853, figure from "A Buried History of Paleontology". "The roaring chorus was so loud and enthusiastic that you could almost believe there roared a herd of Iguanodons." There ´s life in him again! [ROAR!]" Other monsters related to Owens are the terracotta figures of the Natural History Museum of London (Owen was the initiator of the museum), imagined by the artists Waterhouse between 1875-1876, and most of them were realized like the artist want. Fig.4. 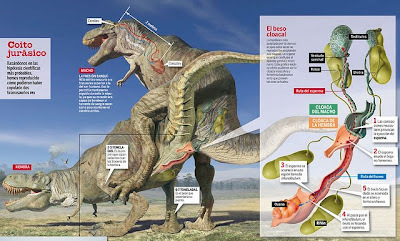 Copulating dinosaurs, foto taken by Dinorider d'Andoandor. Dinorider d'Andoandor posted this reconstruction of dinosaurs doing their best to prevent extinction - the question how dinosaurs copulated, especially species with spines on their back, is intriguing. And speaking of dinosaurs, 100 years ago, famous dinosaur hunter Barnum Brown found an amazing fossil site while drifting down the Red Deer River in Alberta. And if H.G. Giger would be interested in palaeontology, I’m sure his Parasaurolophus would look a little like this (also note the creationist nightmare – the Precambrian Bunny). And last but no least the marvellous story about the missing head of the headless chicken. Searching for old TV-documentaries I rediscovered "Monsters We Met", about the colonization of earth by humans and the consequences for the fauna, the last episode deals with "The End of Eden", New Zealand 800 years ago. Despite animals found a way in our imagination and religion, in the end we were the monster, we even forced to extinction one of the most strange fauna that ever was - the Megafauna of Australia. Back to more recent times: History of Psychology remembers the contribution of Lamarck to Zoology and History of Evolution. "What a pity that I only saw all these wonderful things in a dream, and that I can't actually see them everyday."